Blow away your favorite clients with brilliant options like Foil Pressed Cards and Folded Luxe Cards. 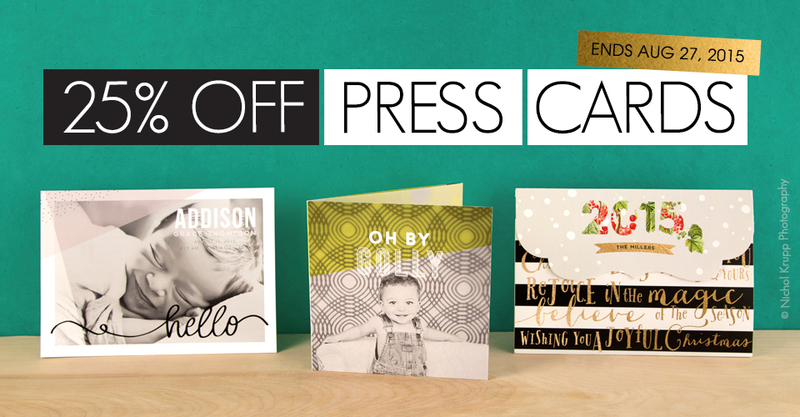 From birth announcements to wedding invitations, our tasteful collection of Press Cards will help you grow a stellar reputation for your business. This offer applies to Accordion Cards, Flat Cards, Flat Luxe Cards, Foil Pressed Cards, Folded Cards, Folded Luxe Cards, and Luxe Pop Cards ordered through ROES and Designer Plus. The sale price will not be reflected in order summaries or email confirmations. The discount will only appear after the order is transmitted and received by the lab. Offer expires at 11:59 p.m. (Central) on August 27th, 2015. Does the press sale include folded business cards? Hi Kathie, unfortunately folded business cards are not included in this sale. Our apologies for the confusion.